With a name like butterfly bush, you might expect a plant to be attractive to butterflies. In fact, it's more than attractive; it's a magnet for all the butterflies who pass through your garden seeking nectar. Many butterfly gardeners plan their garden around Buddleia (pronounced BUD-lee-ah), a genus that includes over 100 species and cultivars. Also called summer lilac, the medium- to large-sized shrubs can anchor a perennial bed or form a hedge. You'll be happier with Buddleia if you accept its growth habit, which is not neat and tidy. Its narrow branches support lilac-like clusters of blossoms a foot or two in length, with side branches and blossoms. After a rainfall, the flower-laden branches of some species can droop all over your flower bed. You'll want to allow at least six feet between bushes to keep some semblance of neatness. But wait till you see the bush covered with fritillaries and tortoiseshells! Even a large swallowtail can land on the cluster, to sip from the many individual blooms. Butterflies and bees will flock to the honey-scented blossoms, whose dilute nectar is sweetest in midday sun. Near a path or patio, the shrub provides delightful fragrance for you, too. Do butterflies prefer certain colors of Buddleia? In my garden, Western Tiger Swallowtails visited all varieties (white and various shades of purple/pink/red). 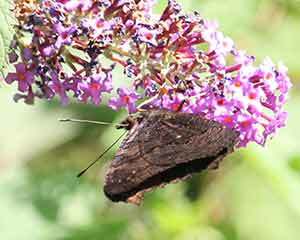 But Red Admirals preferred the white Buddleia while it was in bloom. Gardeners in other parts of the country may notice other preferences, if any. Where did the name Buddleia come from? A seventeenth-century amateur botanist named Reverend Adam Buddle was honored posthumously, when the first butterfly bush reached England in 1774. Though most of today's offerings have Chinese ancestors, this shrub (Buddleia globosa) came from Chile. Its unfamiliar name prompted one nursery tradesman to call it the "Globose Buddlebush." Fortunately, the name didn't stick, but common names like Chilean orange ball tree aren't much better. It's more precise to call it what it is: Buddleia globosa. Victorian-era explorers brought all kinds of exotic plants back to England. From China came seeds of Buddleia davidii, the hardy species that is most familiar to gardeners today. Named after a French Jesuit missionary, Pere Armand David, B. davidii reached London's Kew Gardens in 1896. Today, nurseries continue to develop new cultivars, like 'Raspberry Wine' (Carroll Gardens) and 'Twilight' (Mountain Valley Growers). And horticulturists are still combing the Himalayan foothills for as-yet undiscovered Buddleia varieties. Heronswood Nursery lists three acquisitions from recent expeditions to China and Sikkim: new specimens of B. colvilei, B. fallowiana, and an unverified species (feel adventurous?). Another reason for Buddleia's popularity is that it's easy to grow, even hard to kill. After one of my bushes was flattened by a windstorm, it was pruned and uprighted with little fuss. Buddleia davidii tolerates urban pollution and alkaline soil. It's generally pest-free, except for spider mite infestations during drought or stress. It performs adequately in spare soil but prefers a sunny spot with well-drained soil, a light application of fertilizer in spring, and a few deep waterings in summer. Buddleia can behave like an opportunistic rascal. Says Dalton Durio of Louisiana Nursery, "It always seems to grow best in containers where other, more valuable plants are being grown. These volunteer seedlings come up fast and strong, and they usually succeed in killing the 'host' plant." Buddleia hybridizes easily; volunteer seedlings may not resemble your prized bush. Buddleia is at home in disturbed areas, such as road cuts or new development sites. Its flowers have softened wartime London's bombed lots and the slag heaps of Welsh mining towns. This tendency to be a weedy colonizer, along with its exotic (non-native) status in North America, is now making Buddleia politically incorrect. It's included in the recently published Invasive Plants [Brooklyn Botanic Garden, Handbook #149, 1996, $7.95]. Buddleia davidii has spread from gardens along the Eastern seaboard and the West coast, to roadsides and riparian (streamside) zones. It's not yet considered a serious problem, but it's spreading rapidly. So what's a responsible gardener to do? Sarah Reichard, who has been monitoring invasive plants at the University of Washington, says she's less concerned about Buddleia's use in urban areas. But if you're growing it near a natural area, watch for volunteer seedlings. Remove them and get rid of the plant if necessary (dig out the roots, which will resprout). You can also plant a less invasive form of Buddleia like B. globosa or seek native alternatives (watch for article on regional natives in fall issue of BGQ). Some Buddleia species, like B. alternifolia, B. asiatica, B. colvilei and B. globosa, bloom on last year's wood. They provide nectar for spring and early-summer butterflies, and they shouldn't be pruned until after blossoming. In mild climates, cut back right after blooming for a second show in fall. Prune these bushes judiciously in fall, to maintain shape and remove old, woody stalks. Among the many other varieties of Buddleia which bloom on new growth, it's possible to stagger bloom times for a continuous nectar supply. Deadheading (cutting off) spent blossoms will force the plant to keep blooming, in an attempt to produce seed. My Buddleia 'Lochinch,' kept in bloom well into October, brought a Red Admiral into my garden when I'd given up seeing another. In cold climates, mulch in the fall. Cut back to about a foot high in late winter, before new growth appears. You'll be amazed by the height the shrub attains by midsummer. You'll also get larger flowers and a neater-looking shape. Red-flowering varieties like B. davidii 'Royal Red' will attract hummingbirds, who supplement their nectar diet with protein-rich insects on the bush. Watch for other birds, like bushtits and orioles, seeking an insect meal. Buddleia comes in many more colors and shapes than the following list can include. Height, bloom time can vary depending on geographical location. Microclimates, even within one neighborhood, can also affect growth. Nursery catalogs listed make for some good reading; have fun! Buddleia 'Dartmoor.' Hybrid (prob. B. davidii x var. nanhoensis). Flowering side shoots give bushy shape to pink/purple clusters. Blackberry scent. Long, narrow leaves. 6'; midsummer. B. 'Lochinch.' Hybrid of B. davidii x B. fallowiana. Lavender/blue flowers with orange eye; silvery leaves. Neat shape. 6'; late summer-fall. B. colvilei. Large, tubular, deep pink flowers. Prune lightly after flowering to remove superfluous wood. 15'; mid- to late summer. 'Kewensis' has rich red flowers. B. crispa. Smaller clusters of soft pink flowers with orange eye. Heart-shaped, serrated leaves. Not hardy. 12'; late spring/early summer. 'African Queen.' Large lavender flower spikes. Upright growth habit. 6'; midsummer. 'Black Knight.' Deep violet flowers on long trusses; smaller leaves. Hardy; widely available. 6-8'; midsummer. 'Dubonnet.' Deep purple flowers with orange eye. 6'; midsummer. 'Empire Blue.' Violet/blue with orange eye. Bushy, upright habit. 6-8'; midsummer. 'Fascination.' Lilac/pink flowers on wide clusters. Strong grower. 6'; midsummer. 'Harlequin.' Variegated leaf (cream edge). Bright red/purple flower. Sport (offshoot) of 'Royal Red.' 6'; midsummer. 'White Harlequin' has white flowers; slower to establish. var. nanhoensis 'Nanho Blue.' Lilac/blue flowers; willow-like leaves. 5'; mid- to late summer. 'Nanho Purple' has bright purple flowers. var. nanhoensis 'Petite Indigo.' Blue/violet flowers. Dwarf form: 3-5'; midsummer. 'Petite Plum' has red/violet flowers. 'Alba' has white flowers. 'Opera.' Bright fuchsia flowers on long spikes. Bushy growth. 6'; midsummer. 'Pink Delight.' Bright pink flowers; deep green leaves. Compact habit. Very fragrant. Award winner. 6-8'; midsummer. 'Purple Prince.' Bright purple flower spikes. Upright habit. Very fragrant. 10'; midsummer. 'Royal Red.' Rich maroon flowers that glow in sunlight. Large clusters. Award winner. 6'; midsummer. 'Variegata' has variegated leaves. 'White Bouquet.' Long spikes of white flowers. Dense, upright growth habit. Fragrant. 6-8'; midsummer. 'White Profusion.' White flower with yellow eye. Bushy growth. Award winner. 6-8'; midsummer. B. fallowiana. Lavender/blue flowers. Not hardy. 12'; midsummer. Var. alba has white flowers on long spikes; felted, silvery leaves. B. globosa. Round clusters of orange flowers. Large, leathery leaves. Blooms on old wood. 10-15'; early summer. B. lindleyana. Purple/violet, tubular flowers. Not hardy. 6-9'; all summer. B. macrostachya. Long, drooping clusters of lavender flowers. Fragrant. 10'; mid-late summer. B. nivea. Small clusters of lilac flowers. Huge, woolly leaves. 6'; late spring. Subspecies: nivea grown for its white, felted stems and leaves, not its meager flowering. Ssp. yunnanensis is a 15' version. B. x pikei 'Hever Castle.' Mauve flowers with orange eye. Felted gray/green leaves. Fragrant. Hybrid of B. alternifolia. 5'; early summer. B. salvifolia. Fragrant but modest lavender flowers. Felted, gray/gold stems and leaves. 8'; midsummer. B. x weyeriana. Hybrid of B. globosa. 'Golden Glow' has pale orange flowers in small clusters. 'Sungold' has orange-yellow flowers on long, slender spikes. 10-15'; midsummer. Article by Claire Hagen Dole, Publisher/editor of Butterfly Gardeners' Quarterly. #12, spring 1997.